na-mara | The Goose Is Out! UK-based folk duo, na-mara, perform traditional songs and tunes from the British Isles, Brittany, France, Quebec, Asturias and Galicia as well as self-penned songs in traditional style. They have broadcast on BBC Radio 4, performed at clubs and festivals across the UK and played concerts in Spain and France. 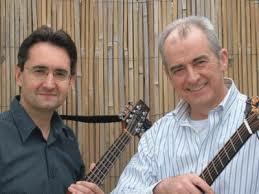 They have been described as “elegant and skilled musicians”. With which we heartily agree! We are delighted to have them supporting Phillip Henry and Hannah Martin! Click here to find out more about na-mara!